194 Marlborough is located on the south side of Marlborough, between Dartmouth and Exeter, with 192 Marlborough to the east and 16 Exeter (196 Marlborough) to the west. 194 Marlborough was built in 1881 by Samuel Stillings and Joseph Lancaster, builders, one of two contiguous houses (192-194 Marlborough). Samuel Stillings, his son Oscar L. Stillings, and N. Henry Chadwick were shown as the owners on the original building permit application for the two houses, dated September 5, 1881. Oscar Stillings and N. Henry Chadwick were partners in Chadwick & Stillings, a hat block and flange company that became a significant house building firm in the 1880s and 1890s. Samuel Stillings purchased the land for 192 Marlborough on November 18, 1881, from attorney Peleg Whitman Chandler. N. Henry Chadwick and Oscar Stillings purchased the land for 194 Marlborough on the same day, also from Peleg Chandler. The two lots were part of a larger parcel Peleg Chandler had acquired on May 15, 1872, from the Commonwealth of Massachusetts. Click here for an index to the deeds for 194 Marlborough. On September 15, 1882, 194 Marlborough was purchased from N. Henry Chadwick and Oscar Stillings by Elizabeth Martingini Whittredge (Neal) Nourse, the wife of Frederic Russell Nourse. They previously lived at 10 Mt. Vernon. Frederic Nourse was treasurer of the Sullivan Silver Mining Company until February of 1884, when he became treasurer of the Oregon Railroad and Navigation Company. Elizabeth Nourse continued to own 192 Marlborough but lived elsewhere for the next ten years. During the 1885-1886 winter season, 194 Marlborough was the home of Julia Lambert (Brackett) Richardson, the widow of iron merchant Jeffrey Richardson. She died in March of 1886. By the 1886-1887 winter season, it was the home of attorney Josiah Prentice Tucker and his wife, Hannah Ralston (Whipple) Tucker. They previously had lived at 51 Chestnut. Their son-in-law and daughter, Charles Ira Bliss and Alice Ralston (Tucker) Bliss, lived with them. Charles Bliss was a merchant. They continued to live there during the 1888-1889 winter season. By 1890, the Tuckers had moved to 311 Marlborough and the Blisses had moved to Hingham. 194 Marlborough was not listed in the 1890 and 1891 Blue Books. By the 1891-1892 winter season, it was the home of lumber dealer Jeremiah Otis Wetherbee and his wife, Martha (Lovejoy) Wetherbee. They previously had lived at 146 Marlborough. They continued to live at 194 Marlborough during the 1893-1894 season, but moved thereafter to 854 Beacon. By the 1894-1895 winter season, 194 Marlborough was once again the home of Elizabeth (Neal) Nourse. Living with her were her son and daughter, Frederic Russell Nourse, Jr., and Elsie Thorndike Nourse, her sister, Caroline Frothingham Neal, and her mother, Elizabeth Boardman (Whittredge) Neal, widow of Theodore Augustus Neal. Elsie Nourse married in October of 1896 to Henry Barnsley Ball, an architect. After their marriage, they lived at 194 Marlborough with her mother. Elizabeth Neal and Caroline Neal moved to The Abbotsford at 186 Commonwealth by the 1897-1898 winter season. By 1899, Elizabeth Nourse and Frederic Nourse had moved to Hyde Park, and the Balls had moved to Milton. Henry Ball died in July of 1901, and Elsie (Nourse) Ball married again in September of 1902 to Robert Wainwright. By the 1898-1899 winter season, 194 Marlborough was the home of Mary (Abbott) Phipps, the widow of hardware dealer John Alfred Phipps, and her two sisters, Adelaide F. Abbott and Georgianna E. Abbott. They previously had lived in an apartment at 220 Marlborough. Mary Phipps died in April of 1901 and her sisters moved soon thereafter. During the 1901-1902 winter season, 194 Marlborough was once again the home of Elizabeth Nourse. She had moved to Cambridge by the time of her death in February of 1903. 194 Marlborough was inherited by her children, Frederick Russell Nourse and Elsie (Nourse) Ball Wainwright. By the 1902-1903 winter season, 194 Marlborough was the home of Josiah French Hill and his wife, Blanche Theodora (Ford) Hill. They had lived at 122 Marlborough in 1902. Josiah Hill formerly was Secretary of the Southern Railroad in New York City. In 1900, they moved to Boston and he joined the investment banking firm of Lee, Higginson and Company, first as a statistician and later as manager. They continued to live at 194 Marlborough during the 1903-1904 winter season, but were living elsewhere during the 1904-1905 season and it was the home of Copley Amory, Jr., an architect and later a broker, and his wife, Mary Forbes (Russell) Amory. The Amorys’ primary residence was their farm in Walpole, New Hampshire. The Hills were living at 194 Marlborough during the 1905-1906 winter season, but during the 1906-1907 season they were again living elsewhere and it was the home of architect Harry Hill Thorndike and his wife, Lucy Barney (Gurnee) Thorndike. They had lived at 301 Beacon in 1906, and by 1908 had moved to 206 Commonwealth. The Hills were again living at 194 Marlborough for the 1907-1908 winter season, but moved thereafter and by the 1909-1910 season were living at 325 Beacon. In July of 1908, 194 Marlborough was purchased from Frederic Nourse and Elsie Wainwright by Frances (Fannie) Elizabeth (Furfey) Nauss. Frances Nauss was the wife of lumber merchant Charles Strum Nauss; they lived in Gloucester. 194 Marlborough became the home of Frances Nauss’s step-father and mother, David Thomas Hanners and Fannie Foster (Wallis) Furfey Hanners, and also the home and medical office of Frances Nauss’s brother, Dr. James Austin Furfey, a dentist. He previously had lived in Beverly and maintained his offices at 235 Marlborough. She also rented office space to other dentists, including Dr. Charles M. Keep (who previously had maintained his office at 235 Marlborough, with Dr. Furfey) and Dr. Maurice E. Peters, who previously had his office at 130 Commonwealth. David Hanners died in July of 1911. Fannie Hanners continued to live at 194 Marlborough until her death in May of 1914. Dr. Furfey continued to live at 192 Marlborough and to maintain his dental office there, together with Dr. Keep and Dr. Peters. He had married in October of 1900 to Florence Edith Mortimer and they had one son, Robert, in 1901. By 1910, they were living apart, and they were divorced in April of 1917. Dr. Furfey received custody of their son, and they lived at 194 Marlborough. Dr. Furfey remarried in 1919 to Edith Venelva Griffin, and they lived at 194 Marlborough. They were divorced in April of 1926. Frances Nauss continued to own 194 Marlborough in the 1950s. In August of 1953, the Building Department issued her a violation notice, indicating that the one room extension on rear of building, at second floor, was in a dilapidated condition, with the steel supports badly corroded and the metal covering corroded and loose. In September of 1953, she filed for (and subsequently received) permission to remove the addition. Dr. Furfey continued to live and maintain his dental office at 194 Marlborough until shortly before his death in August of 1957. He also maintained a home in Bar Harbor. In June of 1957, 194 Marlborough was acquired by the Joseph Vincent Realty Corporation. In October of 1958, it filed for (and subsequently received) permission to convert the property from a single-family dwelling into ten apartments. In June of 1959, 194 Marlborough was acquired from the Joseph Vincent Realty Company by real estate dealer Hugh Richardson Farrington and his wife, Clara Marcellina (Cormier) Farrington. They lived in Arlington. In July of 1964, 194 Marlborough was acquired from the Farringtons by Mark Smith. In 1965, it suffered fire damage to the top floor and roof, and in November of 1965, he filed for (and subsequently received) permission to repair the damage. The property remained ten apartments. 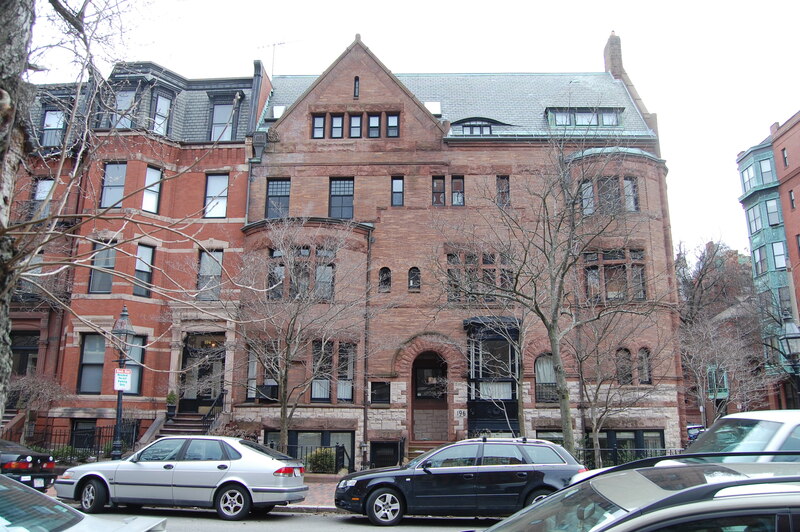 The property changed hands and in October of 1986 was purchased by Carlo A. Sgroi, trustee of the 194 Marlboro Street Trust. 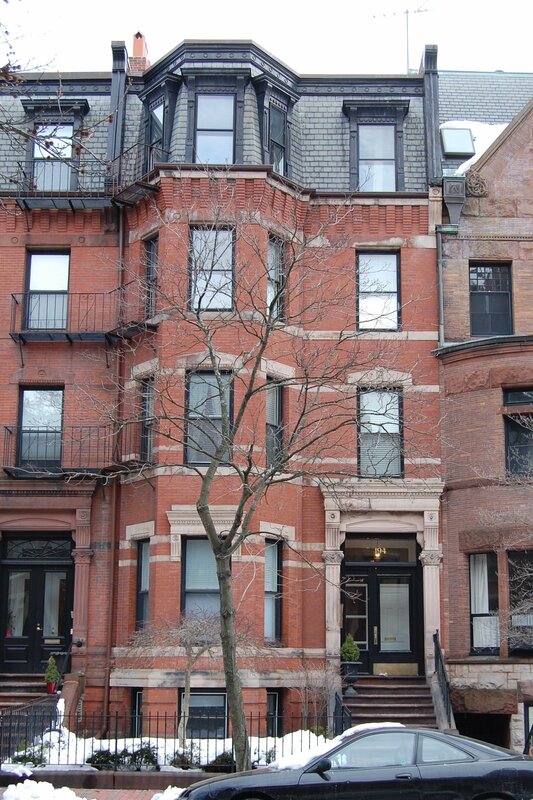 On February 24, 1987, he converted the property into nine condominium units, the 194 Marlborough Street Condominium. 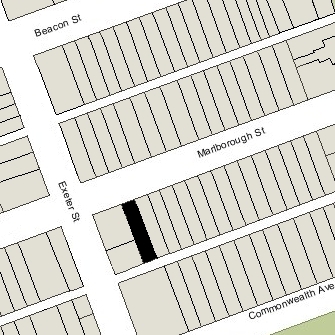 On April 2, 2002, the 194 Marlborough Street Condominium filed for (and subsequently received) permission to reduce the legal occupancy from ten to nine units, conforming with the existing condition.